Calligraphy is expensive enough for most weddings, but imagine taking a completely new approach to name cards for your wedding table settings that probably costs the moon and more. This is where Kim Kardashian and Kayne West come in. 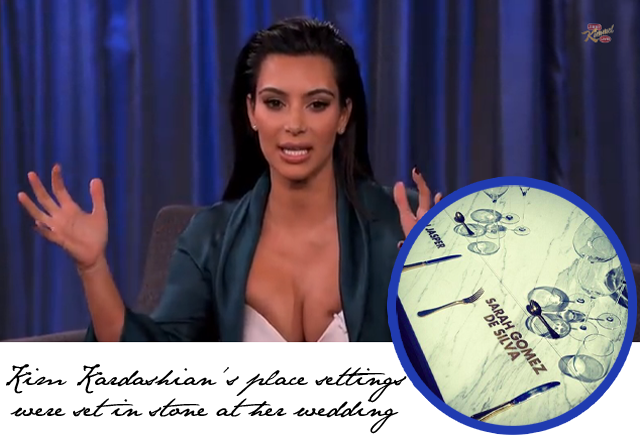 Kim was on Jimmy Kimmel Live last night to catch the Late Night host up on all things bright and beautiful about her recent nuptials. After we heard that her sister was so hungover she had to have her makeup applied while sleeping, Kim mentions a detail that quite literally made my jaw drop to the floor. Rather than table settings, the couple had their guests' names engraved on a large marble table. Kim explains, "we engraved their names because everyone is engraved in our hearts." Now here's the pesky part. Sadly, if you engrave everyone's name, there's no switching names last minute. So if a guest cancels, you're sorta screwed. And yes, that actually happened to the couple, but Kim Kardashian wouldn't give even a hint as to who the deserter was!